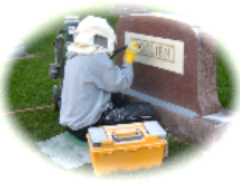 At Hearn Monument we also provide cemetery lettering and engraving as a service to our customers. When you need an inscription or date of death, we can complete this service on location. By performing the service in the cemetery your monument will not be disturbed or moved. We take special care in matching the existing fonts and inscriptions no matter who originally designed the monument. For more information regarding cemetery lettering and engraving, please contact one of our representatives for a free consultation or fill out the form below. All fees for cemetery lettering are required up front. Hearn Monument is a full service monument company. We invite you to complete a request form for any on-site lettering or engraving needs that you may have. This would include death dates, panels and family names. Please complete this form providing as much detail as possible.